Asia Pacific Air Filtration Market size was over USD 3.4 billion in 2015, with 8.6% CAGR estimations from 2016 to 2023. Automotive filters help prolong engine life as they trap debris and dirt that can harm internal engine parts such as pistons and cylinders. The damage may happen even from a minute particle of salt which results in costly repairs. It offers suitable air flow to the engine thereby preserving air-fuel mixture. This enhances the emission control system and minimizes spark plug ignition problems, and arise severe drivability concerns. Suitable air flow enables the engine to function precisely, thus reducing emissions as well as fuel consumption and in turn drive Asia Pacific air filtration market size. Modern products help filtration system designers and plant managers decrease operating costs and boost savings and also comply with obligatory quality standards. Rapid urbanization, resource scarcity and growing environmental awareness are anticipated to drive growth over the coming years. Several technologies are engaged for enhancing the performance and quality of these systems along with reducing the overall cost. The increasing need to reduce energy consumption across several industrial applications may elevate demand for effective systems through 2023. Growing concerns regarding environmental health coupled with reducing raw material resources and natural depositories is primarily expected to fuel Asia Pacific air filtration market share from 2016 to 2023. Industrial systems improve safety features of operating a pressurized system, thereby growing the supply reliability while minimizing the risk of loss of production. Moreover, an effective industrial system aids save energy by significantly reducing energy consumption across other numerous applications. Asia Pacific automotive air filtration market share was over 55% of the overall revenue in 2015 and is projected to grow at over 8% CAGR from 2016 to 2023. Rising need to change these filters regularly as it offers superior engine performance as well as better mileage is anticipated to catapult demand through 2023. 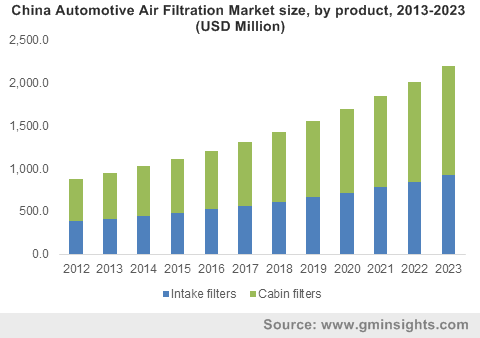 Cabin filters are likely to witness attractive growth prospects owing to increasing application of these devices in fuel powered as well as electric vehicles. Industrial application segment is estimated to grow at 9.5% CAGR from 2016 to 2023 and is forecast to account for more than 25% of the overall industry share by 2023. Dust collectors have minimal maintenance requirements and are capable of removing dust from various industrial operations, improving worker health & safety as well as productivity. Asia Pacific air filtration market share in the power sector is forecast to grow at 9.7% CAGR from 2016 to 2023. The industry finds application used in nuclear use cases such as fuel processing installations & waste management, power generation units, nuclear energy research facilities. Stringent environmental norms demand responsibility from operators in terms of reducing radioactive pollution, which is further expected to drive demand over the forecast timeframe. These systems are also deployed to eliminate different sorts of airborne contaminants from several manufacturing stages. Huge amount of coarse and condensate contamination particles such as oil droplets, abrasion particles, dust and rust get filtered in the first stage, whereas dust particles and oil mist are filtered across the subsequent stages. China air filtration market size is predicted to grow at 9% CAGR from 2016 to 2023. Rapid growing industrialization accompanied by rising number of mid-size cars is predicted to drive regional growth. This can primarily be attributed to the considerable automotive sector and presence of numerous industries across the region. Rapidly expanding aftermarkets in China and India will contribute to high growth. High cost in terms of operation and purchase associated with this equipment may hinder demand. Filtration of contaminated air requires additional application specific advanced equipment which results in increased capital investment. This makes the overall system expensive to operate in terms of maintenance cost and energy consumption. Purchase decision is largely based on the overall cost, which may restrain growth across price sensitive regions. Major industry participants contributing to air filtration market share include Mann+Hummel, Cummins, Mahle, Camfil, Donaldson, and Clarcor. Other prominent market partners include ACDelco, Denso, K&N Engineering, Nederman, Purafil, Sogefi and W.L. Gore & Associates. The industry is characterized by regular mergers & acquisitions, which may lead to consolidation. In August 2015, Mann+Hummel acquired Affinia Group. In February 2014, the company acquired Vokes Air from The Riverside Company. There also exists a significant degree of vertical integration at the design and production level, which helps manufacturers focus on product innovation and design. Environmental Protection Agency (EPA) and Car Care Council (CCC) are associations that promote awareness among consumers for potential health disorders due to harmful emission if proper filtration system is not equipped. Micro-organisms can accumulate in the car and multiply with time this can lead to extreme health disorders including watering of eyes, asthma, nausea, allergic reactions and irritated mucous membranes. Environment threats caused due to emission of destructive gases in IC engine based vehicles has encouraged the necessity to develop environment friendly vehicles. Electric vehicles evolved as the best possible substitute for conventional vehicles. Growth in electric vehicles industry is increasing owing to the fact that consumers want to spend less operational & maintenance cost compared to the fuel powered vehicles. This will negatively impact intake filters demand in the coming years.